We have our Halloween dinner the night before because of all the festivities that we attend. I usually try to keep it simple and fun. 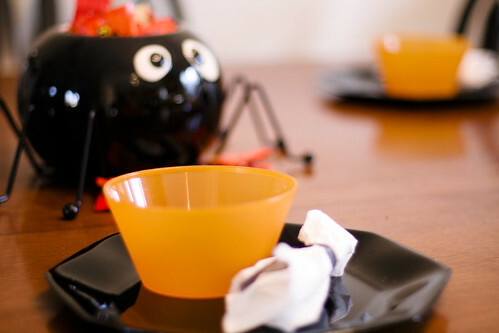 I bought cheap plastic bowls at Jo-Ann’s along with the cute spider candy dish. The napkins are actually paper towels and I tied black organdy ribbon around them to look like ghosts. We are having grilled ham-n-swiss sandwiches and vegetable soup. 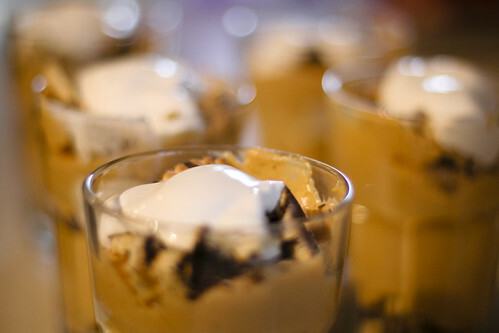 I made these pumpkin parfaits for dessert. I keep that simple too. I just took a package of vanilla pudding, one cup of pumpkin pie filling, and milk. Mixed it together. Then I layered chocolate shortbread cookies, pudding, and whipped topping. Awww….I want to have dinner with you. What fun that all looks like and so creative too. I really want one of those pumpkin parfaits right now, but you can’t get canned pumpkin anywhere around here. I read on another expat blog that the closest place to buy some is London which is about 5 hours from me. With all the craziness that Halloween brings what a great idea for some good family time. Oh my that looks good!!! I will def have to try that!! Mmmmm… nummy! Mmmmm! Looks delicious! Happy LT! MMMMM! Can I come over for dinner?! I love it. Simple and beautiful, as it should be.